I should explain from the outset that I usually like a seat whenever I go to a concert. It’s a sign of age. Too long on my feet and my back starts to hurt. What can I say? I’m nearly fifty. I’m not sure whether calling it ‘a concert’ rather than ‘a gig’ also ages me, but I’m not going to start trying to be down with the kids now. So why am I telling you this? 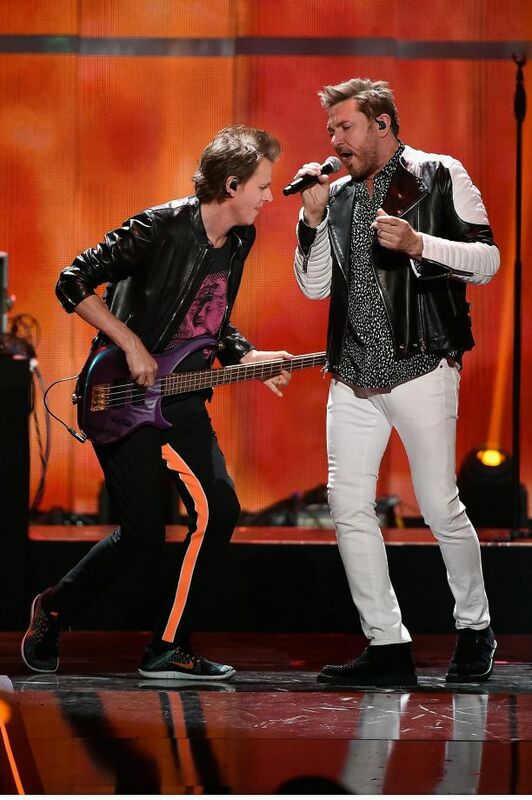 It’s just that in going to see Duran Duran, I abandon my usual desire for a seat in a part of the venue where I can be sure no over-enthusiastic music fan will jump up in front of me and start dancing in favour of the floor section that is, to all intents and purposes, a standing area. Everyone does have an allocated seat, but as soon as the band appears on stage, everyone is on their feet, and that remains the case for the duration of the concert, some two hours in total. I even sway slightly during the night – it’s what passes for dancing at my age – and my accompaniment to every song deserves 10 out of 10 for enthusiasm, even if I have to lip-sync the parts where I’m not sure of the words. In short, I let my hair down – metaphorically, since I’m bald – and enjoy a great night of music. 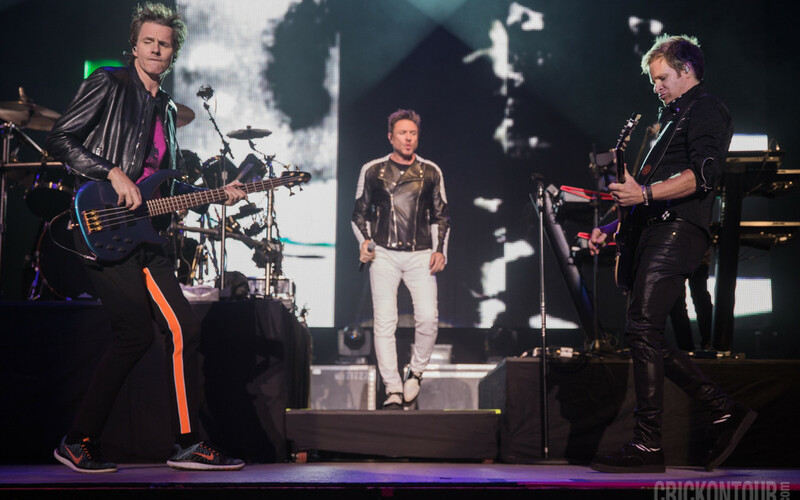 From the moment Duran Duran opened the set with Paper Gods, the title track of their new album, they carried the crowd with them, and that remained the case right up until they took their final bow. The majority of the audience were reliving their youth in one shape or form as they sang their favourite tunes from the 1980s with gusto, while also enjoying some of the new tracks and a few others from Duran Duran’s career that has now lasted well over 30 years – their first single, Planet Earth was released in 1981 – and it’s that connection with the past, as well as the band’s ability to keep producing a high standard of new music, which accounts for their enduring popularity. Planet Earth was one of the most popular songs of the night, though the preceding track, Pressure Off, another 2015 song, was greeted with equal enthusiasm, something which pleased me. They’ve still got it, I thought. Indeed, the songs from the Paper Gods album sounded as good as anything the band played on the night. It might have been the excellent acoustics of the Hydro venue, the enthusiasm of the crowd, or the fact that this is a band who can really play, but at the end of What Are The Chances – one of the stand-out tracks on the new album – Simon Le Bon declared that he didn’t think they had ever played it better. The set was also laced with tracks from the different eras of the band’s career, including Come Undone, Love Voodoo, I Don’t Want Your Love, (Reach Up For The) Sunrise – I still don’t understand the need for brackets in the title – and a rousing version of Grandmaster Flash and Melle Mel’s White Lines. Ordinary World was dedicated to the people of Scotland, and its First Minister, Nicola Sturgeon, who had recently selected the track as one of her Desert Island Discs; mention of her name was met mainly by cheers, but also a few boos. I can only blame some lax stewarding for letting a few ‘better together’ scoundrels into the venue. The encore blended the serious and the celebratory – Save A Prayer was dedicated to the victims of the recent terrorist attack in Paris; the band who were playing at the Bataclan Theatre that night, Eagles of Death Metal do a cover of the song. Thousands of people turned the torches on in their mobile phones, waving them in the air throughout the song. Back in the day, it would have been cigarette lighters. Then the band finished with Rio, against a backdrop of the iconic ‘80s album cover of the same name. It was the perfect end to the concert, sending everyone home in high spirits … and my back didn’t hurt at all.